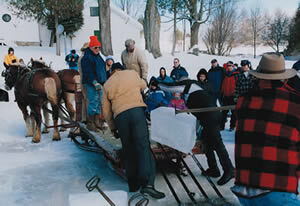 Carve out time to enjoy an old-fashioned ice harvest in rural New York. In Millers Mills, a farming hamlet in central New York, townsfolk honor a long-standing tradition every February — an Ice Harvest that looks like something out of a Currier and Ives print. Millers Mills residents established this much-anticipated social event around 1875, back when dairy farmers needed ice year-round to keep their milk from spoiling. Although the arrival of electrical power here in 1941 changed all that, folks still keep the tradition alive, using the same tools and techniques their forefathers used a century ago. The event now raises money for the Millers Mills Grange and the Community Baptist Church. Crews prepare for the event on Saturday by making shallow cuts in the ice on Millers Mills Pond. The next day, using special saws and old-fashioned muscle, they cut along those scored lines, then break off the heavy blocks with an ice spud bar. 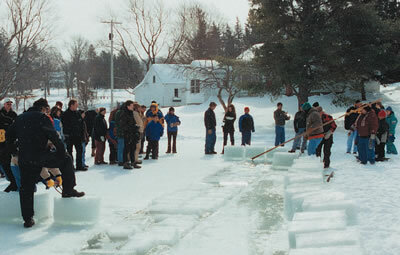 The volunteers then use tongs and pike poles to hoist the blocks–which weigh about 135 pounds apiece–onto horse-drawn sleds bound for the icehouse. After sliding the ice inside, and filling the cracks between blocks with snow, workers insulate each layer with sawdust. Filling the icehouse takes most of the day. If the ice is thick enough, you're allowed to help–and I guarantee you'll work up a sweat! You can reward yourself with a free horse-drawn sleigh ride, a souvenir from the craft booths or some tasty chili, hot dogs and doughnuts. The ice is stored until July, when another Millers Mills tradition takes place: an old-fashioned ice-cream social, featuring ice cream made from the ice. You're welcome to come back to try it–even if you didn't help break the ice! Millers Mills is roughly 5 miles northeast of the intersection of State Highway 51 and U.S. Highway 20 in southern Herkimer County, about 25 miles southeast of Utica. From State Highway 51, go east on County Highway 18 (also known as Jordanville Road) for a 1/2 mile or so to Jones Road, then head south about a mile into town. The Ice Harvest is generally held the second Sunday in February (February 13 in 2005); the day begins with a 9 a.m. church service. The ice cream social is usually on the third Sunday in July. To learn more about both, call Doris Huxtable at 1-315-822-5281 or Dave Huxtable at 1-315/822-5283.